You can log in at one of the eight check-in counters, with the tag of your airline and an adequate number of flight. Please enclose with your ticket and valid travel documents that meet the visa regimes airport transit countries, as well as the airport of destination. Children who travel accompanied by one parent must have a notarized consent of the other parent in order to be admitted to the flight. - 120 minutes of the scheduled departure time of the flight. - 30 minutes before the scheduled departure time of the flight. Closing Time counters can be more restrictive depending on the airline, class, overbooking of seats on flights, etc. We urge passengers to per-call pass passport control and be on time ready to embark on an appropriate exit. Boarding time and exit are indicated on the coupon to enter the plane. Depending on the airline, BUSINESS and frequent flier passengers and their guests who are traveling on the same flight, they can use the services of a business saloon. BUSINESS salon is located in the departures hall and is available for use for two hours before the scheduled departure time of the flight. BUSINESS lounge with a capacity for 20 passengers, offers refreshment drinks and snacks, Internet access, cable television, local and foreign press. For detailed information regarding the rights of use of the business lounges contact your airline. Travellers who after landing at the "Podgorica"airport ​​continue their journey to other flight, we also offer the option of check in for a flight without leaving the customs area airport. This is particularly important for travelers who are not registered for all flights until the final destination as well as for travelers who do not have the right to enter the territory of Montenegro. At the counter for passengers in transit, in the arrivals hall, you can complete the process of check in for the next flight. You are obliged to report luggage which you submitted to one of the previous airport and shoe luggage ticket, so it is automatically loaded onto your flight. Podgorica Airport offers the option to sign in via the Internet at the earliest 24 hours before the scheduled departure time of the flight. Please comply with security measures for hand and checked baggage and corporate restrictions permitted amounts of luggage to you faster and more easily pass aerodrome control. Baggage can be submitted at the registration counter at least 30 minutes before the scheduled departure time of the flight. Pets and animals can be accepted for flight only if special conditions are met. Cats and small dogs small individual animals can take with you as hand luggage provided that together with cage do not exceed 8 kg. Larger animals are accepted on the flight as checked baggage with special treatment(links to a submenu, special baggage) during handling and loading. For detailed information on the conditions and limitations can contact your airline. - 6 to ensure that the child's baggage does not contain goods subject to customs duty or items which are not for children's use. Hand baggage must be put in the baggage compartments or under the seat of the passenger cabin of the aircraft, which leads to a reduction in size, weight and the amount of hand luggage. The general rule is that companies allow only one hand baggage dimensions of 56cm x 45cm x 25cm (according to IATA standards) and weighing up to 8kg. However, this limit may vary depending on the airline, class of transport, routes, tariffs and so on. Please make your hand luggage is in accordance with these rules. For all the details you can contact your travel agent or airline. Please repackage your hand luggage in accordance with the prescribed measures, before arriving at the airport. Otherwise, upon arrival at a security control you will not be allowed to prohibited and improperly packaged items, solids and liquids enter the passenger compartment. For your comfort and safety, airlines may require that your hand luggage on a trolley when on board, to be put of together with checked baggage. Your hand luggage you can take immediately after disembarking from the plane at the airport orientations. - All other carry-on luggage when it comes to smaller planes with a lack of space in the cabin. The responsibility of passengers to hand luggage and other property never to left it unattended. - The rule of weight (weight concept) - travel map determines the amount of baggage in kilograms, regardless of the number of pieces. For example, a passenger in economy class transportation can deliver 20kg, while passenger traveling business class is entitled to 30kg of luggage. - The rule of pieces (piece concept) - travel map determines the number of pieces of baggage, with some additional restrictions. For example putik economy class transportation may submit one piece of luggage weighing up to 23kg, whose overall dimensions (length + width + height) not exceeding 158cm. One hand over passenger luggage with a maximum weight of 32kg. If your baggage is not within the limits (weight, number of pieces, dimensions), the airline is entitled to payment of excess baggage.Please be informed when purchasing tickets on the stated rules and to prepare your luggage in accordance with this and security ( LIST OF PROHIBITED CASE CHECKED BAGGAGE ) limitations prior to arrival at the airport. For all the details you can contact your travel agent or airline. Upon check-in, for each submitted passenger baggage you can get the luggage ticket that you are obliged to keep it until the end of your trip. The luggage section contains a bar code and the same information as the corresponding mark on luggage and used for identification of your luggage when you arrive to your final destination. Lack of cargo segment in case of irregularities with luggage, delays or miscarriage luggage significantly reduces the likelihood of success of the search for misplaced baggage. - Valuable bags, wrap in cellophane to protect them from wear. 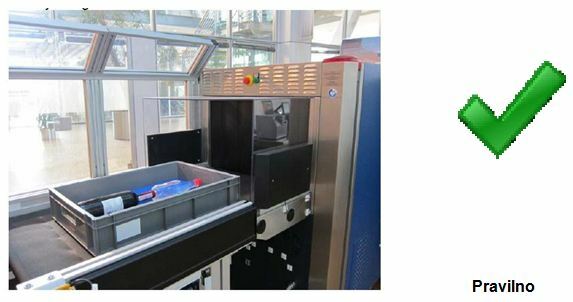 On checking-in baggage, you can check in baggage which because of its size, shape and other characteristics require extra attention during handling and transport. Oversize baggage, animals, wheelchairs and toys, musical instruments, bicycles, equipment for skiing, diving, golf, etc. may be subject to additional restrictions. For more details you can contact your travel agent or airline. Due to the special of the safety of the procedure, you are required when checking in for the flight log in weapons and ammunition in checked baggage. Oversize baggage, cages with animals and other baggage that due to its characteristics can not be transmitted tape storage are treated in a special way. Upon completion of check-in and luggage-tags hanging, it is necessary that luggage taken to oversized baggage compartment, which is located in the extension of check-in counters. You are obliged to wait for the arrival of our officers who will take your luggage and take all appropriate measures to transport the plane. Luggage must not be left unattended until the arrival of our officers, because otherwise that luggage be treated as suspicious and be subjected to special security measures. In case of loss so abandoned luggage Podgorica Airport can not be held liable. The animals must be in an appropriate cage in order to be admitted to the flight as checked baggage.Upon completion of the check-in and putting tags for luggage, cage with the animal does not have to immediately disclose to the section for oversized luggage. However, you are obliged to do no later than 40 minutes before the scheduled departure time of flight (by the above described procedure). In the case of mishandled baggage and damage or loss of personal belongings during the flight, you can contact us at the counter "Lost & Found" (Lost and Found) at the arrival gate. Please have ready the ticket of lost luggage and a plane ticket that contains routing information. To search yielded faster and more effective results, it is necessary to know the basic characteristics of baggage, such as type, manufacturer and color. Service "Lost & Found" will handle all the information collected, issue you a copy of the report of the miscarriage luggage and start searching through the system WorldTracer. Depending on the airline you can select the method of notification of baggage (tel. Call or SMS). Service "Lost & Found" offers assistance services when making records and getting familiar with the rules of passenger airlines in the case of receipt of damaged or stolen luggage. To retrieve baggage must come in person to the premises of the "Lost & Found" (if your carrier does not provide delivery of luggage), show your passport (or identity card - only for the citizens of Serbia) and pay fees if they provide for customs regulations. After the arrival, the baggage can be taken also by a family member with the above-mentioned documents of passengers attach their identity documents and key if luggage is locked. Working time coincides with the time limitation. For more information on fees and customs regime by visiting the website of the Customs Administration http://www.upravacarina.gov.me/uprava. If your airline provides delivery of baggage, your luggage can be delivered on a temporary or permanent address within the territory of Montenegro with the regulation of customs formalities on your behalf. Valuable items found at the airport kept until the takeover by the owner or an authorized state body. Cargo Service of Podgorica airport provides reception and Shipping Commodity shipments of companies and individual in international air traffic. Acceptance shall be solely for the transportation of shipments ready (Ready for Carriage), which must meet the following requirements. Storage and handling of goods is done in the customs- goods warehouse of 305 m2, which is under customs supervision. Warehouse Podgorica airport is equipped with the chamber for accommodation of perishable goods (PER) of temperature 2-8 ° C, a capacity of 11m³ and aperture dimensions 195 cm x 95cm. Working time coincides with airport working hours.